A magnetic train is a form of transportation that suspends, guides and propels vehicles (predominantly trains) using electromagnetic force. This method has the potential to be fast and quiet when compared to wheeled mass transport systems, potentially reaching velocities comparable to turboprop and jet aircraft (900 km/h, 600 mph). The highest recorded speed of a maglev train is 581 km/h (361 mph), achieved in Japan in 2003, 6 km/h higher than the conventional TGV speed record. All operational implementations of magnetic technology have had minimal overlap with wheeled train technology and have not been compatible with conventional rail tracks. Because they cannot share existing infrastructure, maglevs must be designed as complete transportation systems. 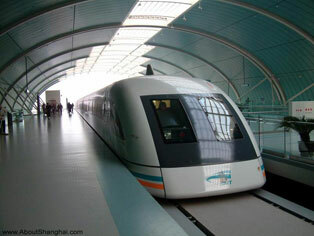 The term "maglev" refers not only to the vehicles, but to the railway system as well, specifically designed for magnetic levitation and propulsion.